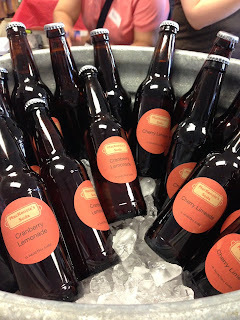 These homemade sodas from young swapper Harrison were a huge hit. The August Chicago Food Swap at Green Home Experts was a huge success. 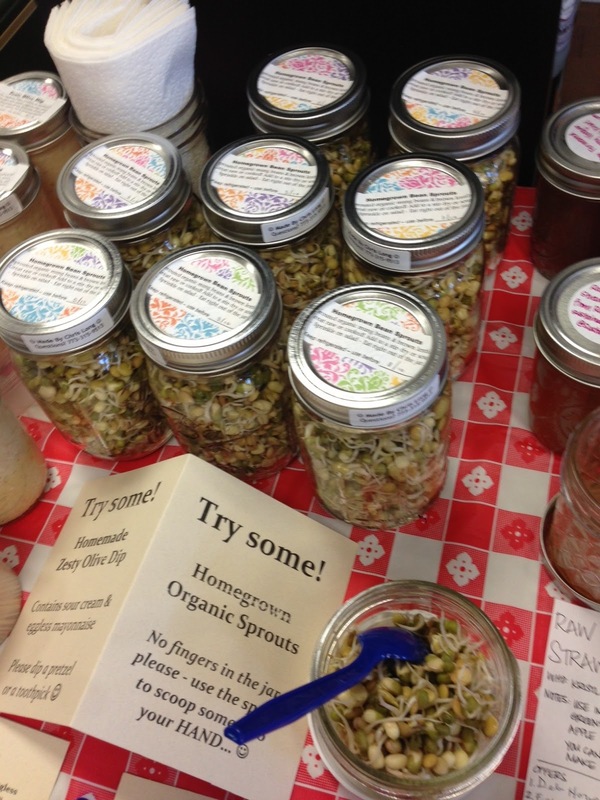 Over forty men, women, kids and babies gathered amid Green Home Experts' eco-friendly products to swap their homemade and homegrown foods. Maria, the owner of Green Home Experts, was a gracious host and I even got to hold her three month old, Eddie. This was our second time at GHE and I hinted to Maria that we should make it an annual tradition. It seemed like we had a lot of first-time swappers this time, but there were definitely a lot of familiar faces too. I really enjoy how it works out so that veteran swappers can keep coming back yet there is always room for new people. Of course, the first-time swappers always want to return, so our community of enthusiastic swappers just keeps growing! Swapper Chris has brought her organic sprouts several times. Given the time of year, I was not surprised to see some beautiful homegrown fruits, vegetables and herbs. Seasoned swapper Stephanie brought her husband, her three sons and an impressive array of produce from their garden, including tomatoes, zucchini, green beans, foraged black walnuts and wild mulberries. (Of course Stephanie also brought her less-healthy, giant chocolate chip cookies and that was what I swapped her for.) First-time swapper Isabel and her husband brought lettuces and herbs that they grow in their city backyard. Not surprisingly, the harvests from these gardens were very popular with the swappers. Savory items are always popular at the swap -- I think because people are excited to have their new things for lunch and dinner in the coming week. To that end, new swappers Amari and Sara's roasted corn and feta salad proved very popular, as did Nekeyua's turkey calzones and veteran swapper Diane's red quinoa salad. (I got two of the turkey calzones and I am going to eat them as soon as I finish here.) Faithful swapper Rachel made two kinds of savory breads; I was lucky enough to score a loaf of her Squash Parmesan braid and it was delicious toasted this morning for breakfast. Of course, if you were looking to stock your pantry with unique items, this was a great swap. 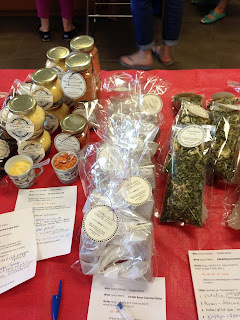 I saw multiple kinds of infused vinegar, several kinds of salad dressings, lots of dips and spreads, hot sauces, flavored sugars and salts, rum vanilla extract (from me), barbeque sauce, granola, pickles and gorgeous jams. New swapper Kasia had a wide variety of beautifully packaged items. My kids loved her caramel pops! I know that I can never leave the swap without something sweet for my kids. This time I hedged my bets by trading for Stephanie's chocolate chip cookies -- the recipe is a closely guarded secret --young swapper Katie's mint chocolate fudge and some of new swapper Kasia's vanilla caramel lollipops. Somehow I managed to avoid bringing home the English toffee, veteran swapper Morgan's peaches-and-cream Bundt cake, the brown butter Rice Krispie treats, new swapper Natallia's unusual amaranth candies, and the various kinds of cupcakes on offer. But I was tempted! There seemed to be fewer drinks than usual -- and I was looking! It is fascinating how the items at the swaps seem to come in waves. But I did notice a grapefruit jalapeno drink syrup, young swapper Harrison's popular sodas, Lissa's homemade tonic syrup and Kristl and Rachel's infused vodka. What creative offerings! We had a fun "extra" at the swap this time. Our friends at Ball Canning and Jars had sent us a case of their limited edition Blue Heritage pint jars for a raffle prize. I was excited that Kristl and Rachel won the jars because they are such devoted swappers. swaps. Speaking of which, the September swap will be September 15 at Peterson Garden Project's education center in the Ravenswood Manor neighborhood on Chicago's north side. (This was the site of last December's swap.) It is a nice, big space so we should be able to accommodate a lot of swappers. That being said, I still expect a full house, so don't wait to register! Registration for the September swap will open on August 18. For more information about the August swap or the September swap, be sure to check out our Facebook page or follow us on Twitter. Several of our swappers are also bloggers and you can read their recaps as well. 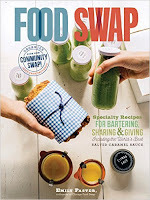 Swapper Amari posted about her first food swap experience, as did food blogger Jennifer.Veteran swappers Kristl and Rachel -- the raffle winners -- posted a recap on their blog with some helpful tips for anyone thinking about attending a future swap. I had so much fun at your event! I cannot wait for the September swap!